The AmericaForever Corporation is proud to announce the latest winners of the Mr. and Mrs. America Contest: Pippy and Poppy Longdawdle of Rumsfeld, Ohio! They're a thoroughly modern couple grounded in traditional values, upholding the best of American exceptionalism in the most exceptional way! "We know a way to counter that old evil eye -- with the latest edition of Pippy and Poppy's Positive Power Pack! This patented method of mental manipulation has been specially culled and curated just for you by Pippy and Poppy! Drawing on the latest top neurocognitive brain researchings by top brain researchers and the time-tested techniques and insights of such top historical mental giants as Sigmund and Froy, Carl Young and Dee Porkchoppa, Pippy and Poppy's Positive Power Pack is guaranteed to chase away your blues, put pep back in your step and dissipate the noxious emanations of negative thinking which congregate in demonic battalions along the the alleyways of your basal ganglia." "You can download a free sample of the last two pages of the first three chapters (plus a special bonus page picked at random by our hard-working algorithms!) of the brand-new upgraded Pippy and Poppy's Postive Power Pack 2.0 at our website, www.americandream.com. Or you can skip the taster and go for the whole feast for only $124.55 (sales tax and profit margin not included). So go on and give that evil eye a big old poke -- of perkiness!!!" Pippy and Poppy founded their Mental Ministry in 1995, after Poppy lost his job as an engineer for a machine-tool company in Cleveland and Pippy was "downsized" from her job as a county mental health professional. But like the perky, plucky couple they are, they kept on plugging, and now oversee a publishing/online/seminar/merchandising empire worth more than $2.5 billion. "But we both share the same love of our great country, the same belief in the values that make America great. As I told him just the other day, 'You know, Poppy, no matter which way America votes, we still get the same benefits: a big, bristling military to protect us from all the evil ones abroad, a conscientious intelligence establishment that uses the latest technology (most of it made in America!) to keep us safe at home, bailouts for our hardworking banks, tax breaks for wealth creators (like us!) and the constant, comforting knowledge that we are citizens of the greatest country that has ever existed or ever will exist on the face of the earth! "Of course, Poppy's not that happy about gay marriage and I sometimes wonder if running death squads out of the White House and drone-bombing innocent people all over the world is perhaps maybe not the most excellent thing to do -- but the important thing is that it all comes out in the wash! Whatever the vote, whoever wins, nothing ever changes in America ... except to get better, of course!" 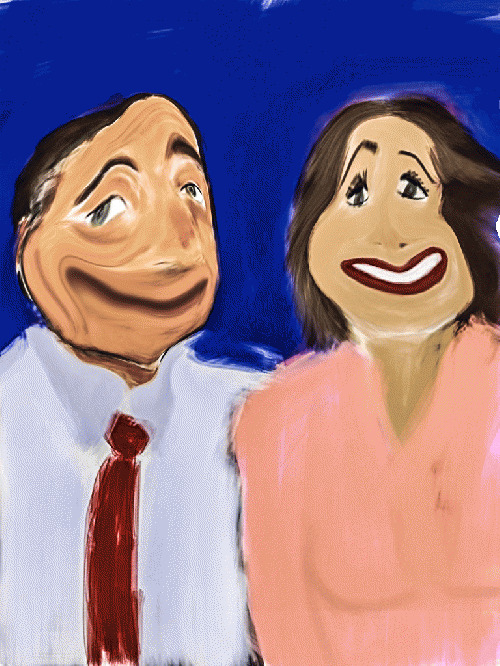 AmericaForever (a subsidiary of Alibaba.com) is delighted to present Pippy and Poppy Longdawdle -- Mr. and Mrs. America!